For five months in mid 2017, Emily Mason did the same thing every day. Arriving to her office at NASA’s Goddard Space Flight Center in Greenbelt, Maryland, she sat at her desk, opened up her computer, and stared at images of the Sun — all day, every day. “I probably looked through three or five years' worth of data,” Mason estimated. Then, in October 2017, she stopped. She realized she had been looking at the wrong thing all along. Mason’s article analyzed three observations of Raining Null-Point Topologies, or RNTPs, a previously overlooked magnetic structure shown here in two wavelengths of extreme ultraviolet light. The coronal rain observed in these comparatively small magnetic loops suggests that the corona may be heated within a far more restricted region than previously expected. Mason, a graduate student at The Catholic University of America in Washington, D.C., was searching for coronal rain: giant globs of plasma, or electrified gas, that drip from the Sun’s outer atmosphere back to its surface. But she expected to find it in helmet streamers, the million-mile tall magnetic loops — named for their resemblance to a knight’s pointy helmet — that can be seen protruding from the Sun during a solar eclipse. 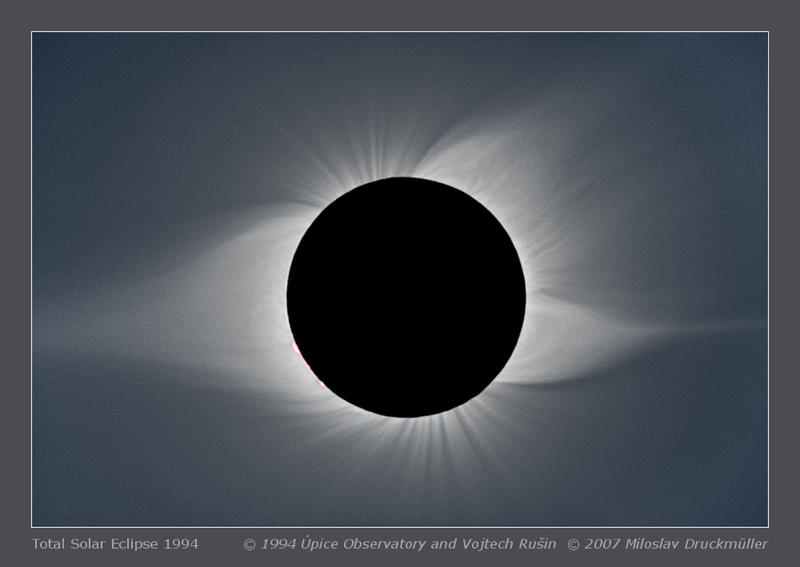 Mason searched for coronal rain in helmet streamers like the one that appears on the left side of this image, taken during the 1994 eclipse as viewed from South America. A smaller pseudostreamer appears on the western limb (right side of image). Named for their resemblance to a knight’s pointy helmet, helmet streamers extend far into the Sun’s faint corona and are most readily seen when the light from the Sun’s bright surface is occluded. The problem, it turned out, wasn’t what she was looking for, but where. In a paper published today in the Astrophysical Journal Letters, Mason and her coauthors describe the first observations of coronal rain in a smaller, previously overlooked kind of magnetic loop on the Sun. After a long, winding search in the wrong direction, the findings forge a new link between the anomalous heating of the corona and the source of the slow solar wind — two of the biggest mysteries facing solar science today. Coronal rain, like that shown in this movie from NASA’s SDO in 2012, is sometimes observed after solar eruptions, when the intense heating associated with a solar flare abruptly cuts off after the eruption and the remaining plasma cools and falls back to the solar surface. Mason was searching for coronal rain not associated with eruptions, but instead caused by a cyclical process of heating and cooling similar to the water cycle on Earth. Observed through the high-resolution telescopes mounted on NASA’s SDO spacecraft, the Sun – a hot ball of plasma, teeming with magnetic field lines traced by giant, fiery loops — seems to have few physical similarities with Earth. But our home planet provides a few useful guides in parsing the Sun’s chaotic tumult: among them, rain. On Earth, rain is just one part of the larger water cycle, an endless tug-of-war between the push of heat and pull of gravity. It begins when liquid water, pooled on the planet’s surface in oceans, lakes, or streams, is heated by the Sun. Some of it evaporates and rises into the atmosphere, where it cools and condenses into clouds. Eventually, those clouds become heavy enough that gravity’s pull becomes irresistible and the water falls back to Earth as rain, before the process starts anew. On the Sun, Mason said, coronal rain works similarly, “but instead of 60-degree water you’re dealing with a million-degree plasma.” Plasma, an electrically-charged gas, doesn’t pool like water, but instead traces the magnetic loops that emerge from the Sun’s surface like a rollercoaster on tracks. At the loop’s foot points, where it attaches to the Sun’s surface, the plasma is superheated from a few thousand to over 1.8 million degrees Fahrenheit. It then expands up the loop and gathers at its peak, far from the heat source. As the plasma cools, it condenses and gravity lures it down the loop’s legs as coronal rain. Mason was looking for coronal rain in helmet streamers, but her motivation for looking there had more to do with this underlying heating and cooling cycle than the rain itself. Since at least the mid-1990s, scientists have known that helmet streamers are one source of the slow solar wind, a comparatively slow, dense stream of gas that escapes the Sun separately from its fast-moving counterpart. But measurements of the slow solar wind gas revealed that it had once been heated to an extreme degree before cooling and escaping the Sun. The cyclical process of heating and cooling behind coronal rain, if it was happening inside the helmet streamers, would be one piece of the puzzle. The other reason connects to the coronal heating problem — the mystery of how and why the Sun’s outer atmosphere is some 300 times hotter than its surface. Strikingly, simulations have shown that coronal rain only forms when heat is applied to the very bottom of the loop. “If a loop has coronal rain on it, that means that the bottom 10% of it, or less, is where coronal heating is happening,” said Mason. Raining loops provide a measuring rod, a cutoff point to determine where the corona gets heated. Starting their search in the largest loops they could find — giant helmet streamers — seemed like a modest goal, and one that would maximize their chances of success. These structures differed from helmet streamers in several ways. But the most striking thing about them was their size. While the findings don’t say exactly how the corona is heated, “they do push down the floor of where coronal heating could happen,” said Mason. She had found raining loops that were some 30,000 miles high, a mere two percent the height of some of the helmet streamers she was originally looking for. And the rain condenses the region where the key coronal heating can be happening. “We still don’t know exactly what’s heating the corona, but we know it has to happen in this layer,” said Mason. But one part of the observations didn’t jibe with previous theories. According to the current understanding, coronal rain only forms on closed loops, where the plasma can gather and cool without any means of escape. But as Mason sifted through the data, she found cases where rain was forming on open magnetic field lines. Anchored to the Sun at only one end, the other end of these open field lines fed out into space, and plasma there could escape into the solar wind. To explain the anomaly, Mason and the team developed an alternative explanation — one that connected rain on these tiny magnetic structures to the origins of the slow solar wind. In the new explanation, the raining plasma begins its journey on a closed loop, but switches — through a process known as magnetic reconnection — to an open one. The phenomenon happens frequently on the Sun, when a closed loop bumps into an open field line and the system rewires itself. Suddenly, the superheated plasma on the closed loop finds itself on an open field line, like a train that has switched tracks. Some of that plasma will rapidly expand, cool down, and fall back to the Sun as coronal rain. But other parts of it will escape – forming, they suspect, one part of the slow solar wind. Mason is currently working on a computer simulation of the new explanation, but she also hopes that soon-to-come observational evidence may confirm it. Now that Parker Solar Probe, launched in 2018, is traveling closer to the Sun than any spacecraft before it, it can fly through bursts of slow solar wind that can be traced back to the Sun — potentially, to one of Mason’s coronal rain events. After observing coronal rain on an open field line, the outgoing plasma, escaping to the solar wind, would normally be lost to posterity. But no longer. “Potentially we can make that connection with Parker Solar Probe and say, that was it,” said Viall. But then again, if Mason had found what she was looking for she might not have made the discovery — or have spent all that time learning the ins and outs of solar data.